ISIS have reportedly kidnapped almost 200 children to use as human shields in the battle for Mosul. The Iraqi Observatory for Human Rights said 197 children had been taken hostage by the terror group near the Al-Nuri mosque where ISIS declared its caliphate nearly three years ago. Elsewhere today Iraq's prime minister Haider al-Abadi boldly claimed the terror group will be defeated 'within weeks' in the country. He told Fox News: 'At the moment we are at a very important juncture where Daesh is on the retreat. We in Iraq have been killing Daesh, removing them from our land. We are killing their aim so that recruits are minimal at the moment. He also said last week's Westminster terror attack was a result of ISIS trying to maintain its reputation as it faces defeat in Iraq. He told the broadcaster: 'They are trying to attract more recruits by doing these criminal acts'. He was speaking after Iraqi forces reportedly killed 10 ISIS chiefs in a fresh round of air strikes in Mosul. 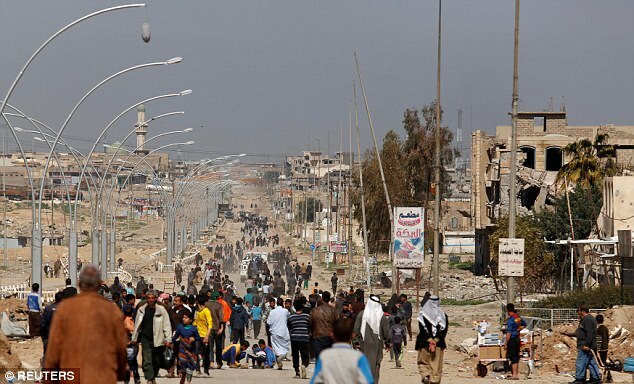 The renewed offensive came days after 'tragic' US-led bombing raids killed 200 civilians in a single district. Rescuers were still pulling the bodies of women and children from rubble in the Jadideh neighbourhood on Saturday, more than a week after the US-led coalition bombs reportedly landed on March 17. However on Monday, Iraqi forces renewed their offensive against ISIS in Mosul's Old City. 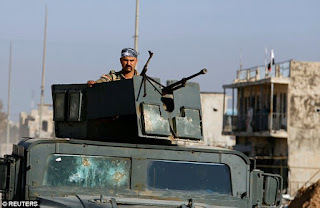 As well as the death of 10 ISIS chiefs, Major Ammar Qassem, from the Iraqi army, said clashes between Iraqi forces and terrorists near the town of Tal Afar, west of Mosul, had also left a further 17 ISIS members dead. 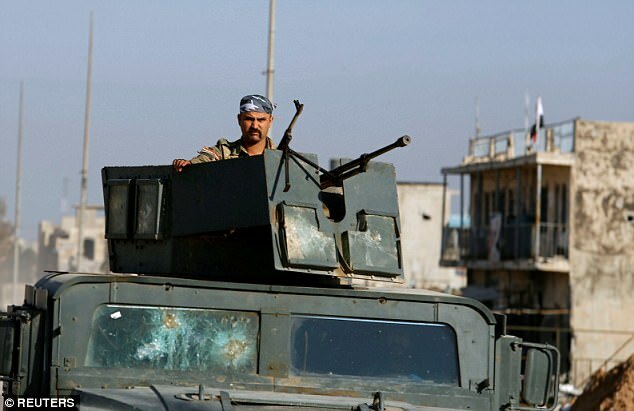 In retaliation for the US-led coalition airstrikes, ISIS militants set fire to 12 medical storehouses and a blood bank near the Nineveh health department, according to Col Khodeir Saleh, Basnews reported. Jawdat said that one of their targets is Faruq Street, which runs near the Al-Nuri mosque where ISIS declared its caliphate nearly three years ago. ISIS chief Abu Bakr al-Baghdadi made his only known public appearance at the mosque after ISIS seized Mosul in 2014, calling on Muslims to obey him. Reports suggested the disputed air strike, or strikes, killed civilians in the Jadideh neighbourhood. British planes were among those operating in western Mosul at the time. However, in a statement today, the Ministry of Defence indicated there was nothing to suggest the RAF were involved in the raid that led to the civilian deaths. 'As operations to liberate western Mosul and Raqqa intensify, the RAF continues to provide precision close air support to ground forces engaged in difficult urban combat,' a spokesman said. 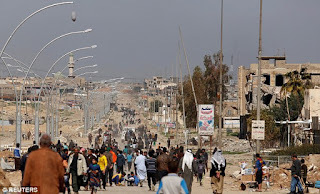 Some officials from Nineveh province, of which Mosul is the capital, have put the death toll from the strikes in the hundreds, but the precise number of victims is still unclear. However, the Iraqi military, on its Facebook page, issued a detailed rebuttal of claims that an air strike was behind the civilian deaths. Iraqi military experts checked a house 'reportedly targeted by an air strike and they found out that the house was completely destroyed and there was no sign that it was destroyed by a strike'. The statement also named al-Resala neighbourhood rather than Jadideh. In a separate incident, mortar shells sparked a major fire in the Nabi Yunus market in east Mosul on Sunday, reportedly killing at least two people and injuring many others. Iraqi forces have been operating in the area of the Old City for several weeks, but they have faced tough resistance and progress in the area has been slow. Iraqi forces launched the operation to retake Mosul, the country's second city, in October, retaking its eastern side before setting their sights on its smaller but more densely-populated west. Since launching their assault on the western sector, Iraqi forces have taken several districts and key buildings including the headquarters of Nineveh province's regional government and a railway station. The fall of Mosul, Iraq's second city, would be a major setback for ISIS following months of losses in Iraq and neighbouring Syria. The city also holds huge symbolic significance for the terror group. In neighbouring Syria, three separate forces are advancing on the city of Raqqa, the main Syrian city under ISIS control. The United Nations has warned around 400,000 people are 'trapped' in the central Mosul area under siege-like conditions as Iraqi forces battle the ISIS for the city's west. Food is running short and security is fragile even in liberated areas. The Reach Initiative, a group that helps aid groups collect data on humanitarian crises, said the situation in west Mosul was 'severe to extremely severe'. 'In areas still under (ISIS control), there is no access to markets and people are surviving on depleting food and water stocks, without access to electricity, fuel and healthcare,' it said.